Will The Inherent Vice Movie Be Good? Director Paul Thomas Anderson’s follow-up to his critical darling The Master is an adaption of Thomas Pychon’s 2009 goofball of a novel, Inherent Vice. It’ll be the first time a Pynchon novel has ever been adapted for the big screen. Filming wrapped in August, and a release of mid- to late-2014 is expected. But will it be any good? Let’s take a look. Source Material/Screenplay — While Inherent Vice is often described as “Pynchon lite,” it’s still a wacky pun- and joke-laden, indecently complex, and heavily charactered piece of fiction. The story is about a stoner P.I. named Doc Sportello who, in 1970s Southern California, tries to solve an increasingly mixed-up plot involving the disappearance of his ex-girlfriend Shasta and a real estate mogul named Mickey Wolfmann. I liked the novel a lot — reading it feels like what it must be like to go through life as a stoner. Cause is often loosed from effect, things just happen, and there’s a plethora of plot and thought digression (though not as much as in a typical Pynchon novel). So I think the key to making this work will be the judiciousness of the cuts PTA, who wrote the screenplay, is able to make and still capture the complexity of the mystery and the “romp-like” feel of the story. One last note: A clear strength of the novel is its dialogue — and this will be a lot (I mean, A LOT) of fun on the big screen. Director — As I read the novel, I kept thinking that it had Coen Brothers written all over it — there’s definitely some Lebowski-ness to this story. But if there’s any other director who can pull off a Pynchon adaptation it’s gotta be PTA. If you’re not familiar with his stuff, in addition to The Master, PTA is the genius behind There Will Be Blood and Boogie Nights (which he made when he was only 27 years old! ), among others. Like Pynchon, some say PTA is an acquired taste, but if you like his stuff, you’d have to agree that the chances are good he’ll nail this one, too. the entire cast — it’s an impressive group. 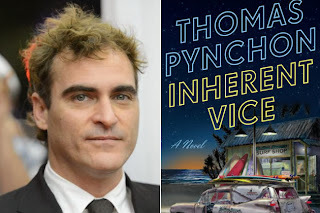 Wild Card — There’s a reason Pynchon’s never been filmed, and again, while Inherent Vice is probably Pynchon’s most accessible novel, it’s still not Dan Brown. Will it work? Here’s something else to think about: Pynchon had to have given his sign-off on the option for the film — what if he makes an appearance at the premier? Is that something you might be interested in? Okay, probably a long shot. But overall, I think PTA can steer this to success, but like The Master, it may be more critical success than commercial. It's a goofy romp of a novel about a stoner private investigator in 1970 Southern California named Doc Sportello. Doc has to investigate the disappearance of his ex-girlfriend Shasta, and her new boyfriend, a real estate mogul named Mickey Wolfmann. Along the way, he has to avoid running afoul of the hippie-hating, straight-laced LAPD detective Bigfoot Bjornsen, who is also investigating the case. But then things get a little odd — there's an organization called Golden Fang that is made up of dentists may be a drug front for...something else. There are beach bunnies, and threesomes, and LSD trips, and an awesomely hilarious trip to Vegas, and some crooked cops, and a hitman, and man, this novel was just a lot of fun. The dialogue in this novel is freakin' fantastic — it contains a lot of Pynchon's signature jokes and puns. (Guy says, in reference to evidence, "we'll have to run this by the lab," calls his dog, a Labrador comes bounding in, etc.) It's stupid, but it's funny. Beyond the jokes, though, there are plenty of digressions, and things just happen for no particular reason — you won't not confuse this with a Pynchon novel, even if the "psychedelic noir" is a new genre for Tommy P. And just when you start think you've got it figured out, you veer off into another direction. It's definitely not just a straightforward mystery, but that is part of the fun of the novel. And I really did have fun with this book. It's one of those novels that, if you don't let yourself get frustrated that you don't get every joke and movie and music reference (you won't) or remember every tenuous character connection (you won't), and just enjoy the plot and writing, you'll probably have fun with it, too. Also of note, director Paul Thomas Anderson (of The Master, There Will Be Blood, and Boogie Nights fame) has just wrapped filming on an adaptation of Inherent Vice. It's the first time a Pynchon novel has been adapted for the big screen. And it's expected to be released mid- to late-2014. I wrote a post for Book Riot about the adaptation today, which I'll post here later this week, as well. I picked up Scott Hutchins' debut novel, A Working Theory of Love, because it sounded like a good facsimile of a Jonathan Tropper novel. And it is, to some degree, but it's more a like a Tropper on downers. The novel's about mid-30s dude named Neill Bassett, recently divorced and living in San Francisco, and working for a start-up company attempting to bring consciousness to a computer. Neill's a self-deprecating, semi-depressed dude, who can't seem figure out where life will lead next. In the opening pages of the novel, we see a desperate Neill pretending to be a tourist at a youth hostel so that he can pick up younger women who are visiting San Francisco and need a "tour guide" — it's a move a friend told him about, but which he's not sure he's fully committed to. But it works! He meets cute, mysterious 20-year-old Rachel who is pretending to be from Tel Aviv, but who is actually from Jersey, having just moved to SF to get a new start on life. Once Rachel and Neill come clean about their respective ruses, they start hanging out and form an unlikely, but tenuous bond. But Neill, in general, seems to be annoyed by people, especially hipsters, ("The tight clothes, the tiny hats — their major struggle as a generation seems to be reducing drag. As if success in life requires being ever ready to slip through a narrow opening. "), and he's somewhat confounded by the absurdity of his job. That's especially true when you consider the computer he works with — built by a famous artificial intelligence scientist and an Indonesian programmer — is based on 5,000 pages of journal written by Neill's dead father (who committed suicide when Neill was in college). Neill spends his days talking via instant messenger to essentially what is a computerized reanimation of his dead father. The goal for the computer — named Dr. Bassett (Neill's father was a physician) is to pass the Turing test — that is, fooling human judges at least 30 percent of the time that it is a real person. What will it take to do that? Will the computer need to be programmed with real human vices? Or, conversely, with real human love? What, indeed, is the working theory of love that will allow the computer to learn real human connection? And, similarly, what is the working theory of love that will allow the divorced Neill, who thought he'd found his soulmate, to form real human connections in his own life? This is one of those novels that's probably a much better book than I'm willing to give it credit for. For one thing, it seemed odd that we don't find out until near the end why Neill's father killed himself, and we never really see Neill wondering at all about it. For another, while the novel is really funny at times (most often when Hutchins is ripping on silly hipsters), it felt like Hutchins tossed too many balls in the air for this to work completely. For me, whatever Hutchins intends the real theory of love to be got a bit lost in theories on artificial intelligence, set-piece love letters to San Francisco (which, actually, were fairly cool — San Francisco is one of my favorite cities), Neill's strange relationship with his mother, Neill's relationships with various other women, and Neill's relationships with his coworkers. If you liked Robin Sloan's Mr. Penumbra's 24-Hour Bookstore, you may like this, too. The subject matter is very different, but the writing and overall feel are similar. (For the record, I wasn't a huge fan of that novel either.) But if you're looking for a Tropper-esque breezy, funny dude lit, this may not be the best solution. Is it fair to say that Neil Gaiman's American Gods, published in 2001, has already achieved "new classic" status? I bet Gaiman's diehard fans would say so. Me? I liked this book well enough, but it didn't change my life. I appreciated the storytelling, the craft, and the creativity. I enjoyed reading it. But it's not a novel that left me breathless, as it has so many Gaiman fans. So in lieu of a review, here are a few general thoughts about the book. 1) This is the first time I've read Gaiman, and through the first 200 pages or so I had to remind myself I wasn't reading Stephen King. Gaiman fans probably see that as a slight. I don't mean it as such — it was just a thought that occurred to me in the first pages, probably because of the supernatural elements, the dialogue, and the roadtrip-ness, and that I had trouble removing from brain after. 2) Strangely enough, even with all the supernatural flair here, my favorite section of the novel is the part where Shadow makes a domestic life for himself in the cold environs of Lakeside, Wisconsin. It's such a contrast to everything that came before and then comes after. It's a quiet, mysterious section of story. And I thoroughly enjoyed it. "Fiction allows us to slide into these other heads, these other places, and look out through other eyes. And then in the tale we stop before we die, or we die vicariously and unharmed, and in the world beyond the tale we turn the page or close the book, and we resume our lives." "Religions are, by definition, metaphors, after all: God is a dream, a hope, a woman, an ironist, a father, a city, a house of many rooms, a watchmaker who left his prize chronometer in the desert, someone who loves you — even, perhaps, against all evidence, a celestial being whose only interest is to make sure your football team, army, business, or marriage thrives, prospers and triumphs over all opposition." 4) There are a surprising number of surprises in this novel! Just when you think you've got it figured out — new gods vs. old gods, old gods are fading because Americans lack belief, Wednesday is leading a war to the death — Gaiman gives you the slip. I really liked this about the novel, as I'd been under the impression that it was lots more "straightforward" than it is. 5) Speaking of which, man, there's a lot to unpack here — the foundation and nature of belief, delusion vs. faith, the soul of America, the fine line between life and death, loyalty, evil, etc. The depth of this novel was also a surprise. I'd gone in thinking it was a fairly straightforward book with some goofy supernatural stuff — I even kind of made fun of this book before giving it a try. It's a profound, smart story that does really require a second (or third or fourth) reading to figure out in total. I don't know whether I'll be doing that, but I'm certainly glad I finally gave Gaiman a shot — and looking forward to reading more by him. You don't read Jhumpa Lahiri if you need a giggle. The short stories here in her 2009 collection Unaccustomed Earth are at best somber (with just a smidgen of hope here and there? ), and at worst, downright depressing. But you do read Lahiri to be awed, if not by the stories themselves, then by the polish of her prose. In fact, I didn't like all, or even most, of the stories in this collection. But I loved reading them. This collection includes five stand-alone stories, and then three connected stories about the same two characters. If you're familiar with Lahiri (and if not, I'd highly recommend checking out her new novel The Lowland, one of the best books I've read this year), you'll be familiar with the theme here — the collision of old tradition and Indian culture with new tradition and American culture. Many of these stories are about marriages or relationships between the children of Indian immigrants and Americans, and the sometimes uncomfortable tension between Indian traditions (like arranged marriages) and American ones (not arranged marriages). My favorite story in the collection is titled "Nobody's Business," about a young Indian woman named Sang, who rents a room in a house in Boston occupied by a nerdy grad student named Paul. Sang is constantly getting phone calls from ambitious Indian men — directed to her by her parents — asking, in so many words, to marry them. Sang, meanwhile, is dating a guy named Farouk, who may or may not be cheating on her. Paul, as well, has found himself with a crush on Sang, and soon things get all tangled up and feelings are trounced upon. I loved the idea of the tradition of Indian arranged marriages juxtaposed with Sang's "modern" relationship. Both are rather fraught with difficulty. The title story "Unaccustomed Earth," the longest story in the collection, is also a favorite. It's a quiet, somber story about a woman named Ruma, who has moved to Seattle with her husband Adam. When Ruma's widower father comes to visit, she debates whether to invite him to live with them, per what Indian tradition would expect of her. But Ruma's father isn't willing to give up his independence so readily — nor is he willing to reveal his new secret late-in-life love. The quasi-novella of three connected stories tells the not-so-whirlwind romance of Hema and Kaushik, the children of two families of Indian immigrants. The stories shift perspective and follow the characters into adulthood, where they eventually meet up again by coincidence. This forces us to wonder that since these two knew each other as children, and meet again later in life, what is the difference between "fated" lovers and arranged lovers? Don't read this story if you're already feeling a little down. It's a downer times ten. I read these stories one-a-day over the course of a couple weeks, and as I said, really enjoyed the experience of reading them, if not each of the stories themselves. But as far as short story collections, you could definitely do worse than this — especially, if like me, you're totally enthralled with Lahiri. Do you believe it? 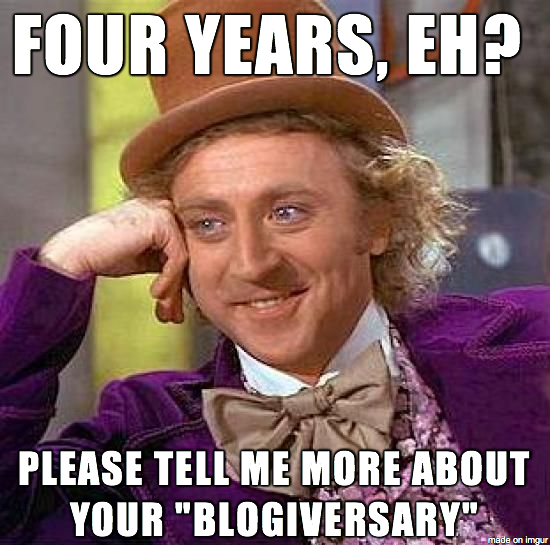 This lightly trafficked corner of the web has now existed for four solid years! While the focus of the content here has slowly shifted over the past several years to almost strictly book reviews and reactions, writing here is still a thing I really enjoy. Yes, it's still fun for me. I still wake up in the morning on days I'm planning to post excited to write. I still lay in bed at night thinking about how to frame a reaction to a book, how to make sure you get the best idea of how to make a decision on whether to try the book yourself, and how to really capture what I thought of a book without resorting to "Mehs" or "I just didn't connect with the characters." Of course, the thing that most keeps this fun is interaction with you readers. I'm still energized by your comments, and hearing that you enjoyed a book I wrote about here. Seriously, even if it's only one person who gets something out of a post, it's worth it. I feel like I write this often, but I started this blog mostly as a creative outlet for me. I had no idea if anyone would read, and I'm still not one who religiously tracks traffic numbers or anything. Honestly, I'm just happy to still be here, and that you are too. Thanks, as always, for reading! 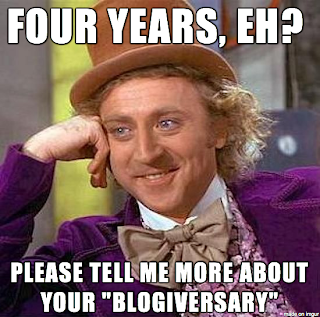 And while we're celebrating, let's all wish a heartfelt happy second birthday to Book Riot! I'm continuously in awe of the hard work and creativity that goes into that site. It a site that has constantly evolved and come up with new and fun ways to keep readers interested. (Have you checked out the Book Riot Podcast? It's really, really good. I can assure you you'll be entertained.) I'm very privileged to be a part of Book Riot, and I hope that if you're not yet a regular Riot reader, you'll give it a chance.